I had been very much looking forward to the final Portuguese sector of this walk in the Minho which would take us from the beautiful and historic town of Viana do Castelo right up to Caminha which lies on the Minho River facing Spain. Once again, on a chilly morning just before dawn, our meeting point was at the FCP Dragão Stadium in Porto and at 7.00 a.m. people began turning up on what promised to be a clear day. The coach journey passed rapidly and we soon approached Viana do Castelo crossing over the Lima River estuary and arriving at around 08.30 a.m. Drop off point for the group, this time 93 participants plus the effervescent little Tico, was at one of Viana’s landmark pastry/coffee shops Zé Natario’s where some of us could enjoy a deliciously warm and lightly crisped Bola Berlim (donut), fresh from the oven, or a Bolo de Arroz (rice cake) accompanied by a meia de leite (flat white coffee) or an expresso! Heavenly at that time of morning! 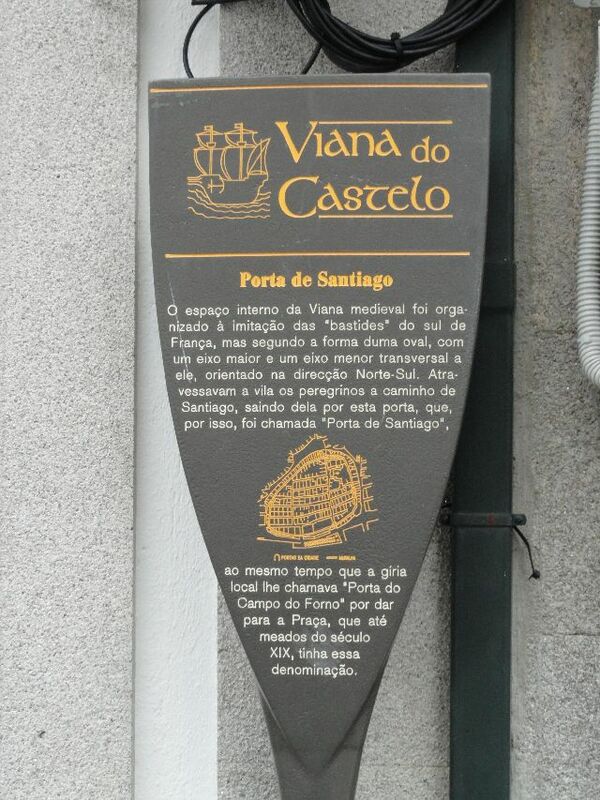 A special mention here about the town of Viana which was founded and named by King Afonso III of Portugal in 1253. In the 16th century, its sea port gained great importance as one of the main ports from which Portuguese explorers set sail, due to the discoveries. Many of the most remarkable buildings in the town are also from this era. Its traditional folklore is among the richest in the country with a cycle of festivals that begin in May and finish in August with girls wearing traditional Minho costumes exhibiting genuine gold filigree jewellery. Our instructions from here were to make our way to the main public town square and from there to the Cathedral where we would have our credentials stamped. Along the way we passed an interesting sign ‘Porta de Santiago’ marking the place of one of the original medieval gates which pilgrims would have to pass through on their way to Santiago. First stop for stamping the credential was the small minister’s office where our volunteer stamper had cycled over to meet us first thing in the morning. Being a very cold morning he kept his cycling helmet on whilst stamping everyone’s credentials always with a smile on his face. The Cathedral itself is a magnificent building originally dating back to the 15th century and having had many renovations over the centuries. Inside there is a baptismal font and multi-coloured wood carvings mainly from the 17th century. One can also see a 16th century painting on wood (Senhora da Consolação Chapel) and appropriately, in the Seafarers Chapel, a miniature galleon. 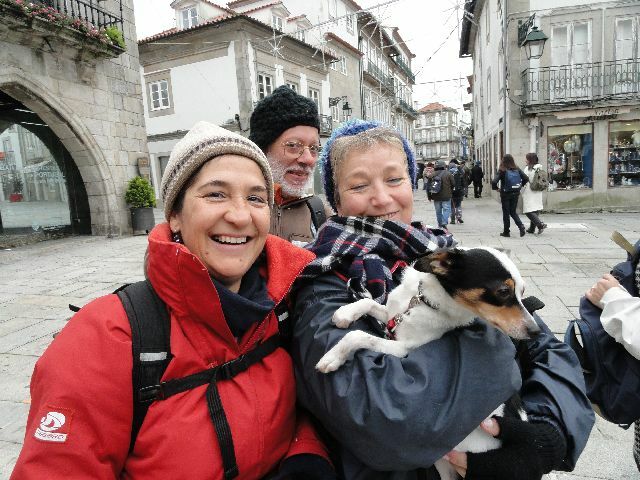 On the Cathedral steps, we were able to have a second stamp put in our credentials kindly given by a volunteer of the Viana group of Friends of the Caminho de Santiago better known as AACS – Associação dos Amigos do Caminho de Santiago de Viana do Castelo. Then it was time for a group photo and we got underway. A group of walkers this size group is quite large but once everyone was on their way, people spread out forming into groups each walking their own pace. The peacefulness of following cobbled stone paths running through small coastal villages is an experience in itself. We found that behind high granite walls hid extremely beautiful and old Portuguese style homes with wonderful manicured gardens. We walked along forest tracks, over running streams with amazing granite bridges, came across an old community wash tank and had the pleasure of seeing the different flora that is typical to this region. Local residents would encouragingly call out to us ‘Bom Caminho’ and ‘Feliz Natal’ (Merry Christmas) and then give us a wave which we found so refreshing and friendly! What was interesting too were the different styles of buildings with doors that had beautiful door knockers adorning them. Also each of these footpaths or small narrow roads carried a plaque made from granite with the name engraved on it. There was, as always on these walks, an endless array of incredibly beautiful animals who observed us carefully as we walked past them. We were very fortunate to be able to see three beautiful examples of the Minho region’s breed of cattle called ‘Cachena‘. These magnificent animals have very long horns yet have such a soft and gentle look in their eyes. They were, and sometimes still are, used as a form of transport for goods in the more isolated villages in the north of the country. 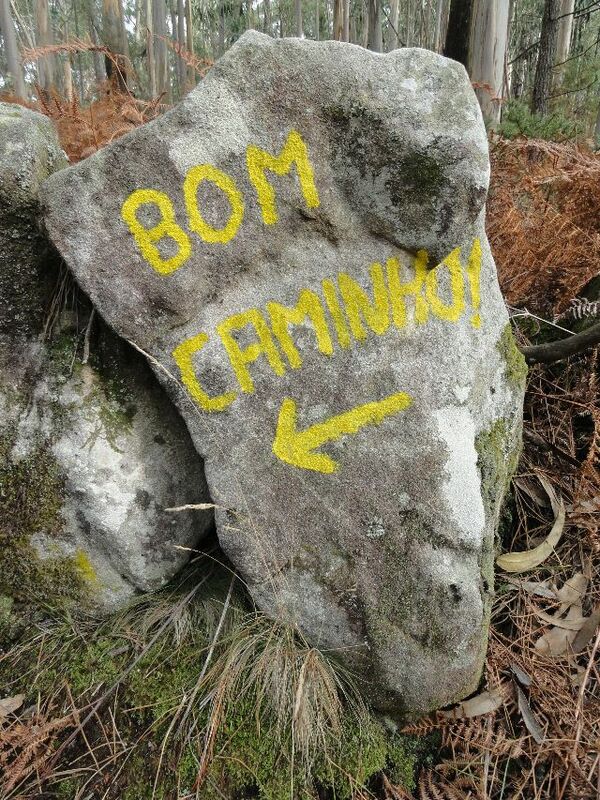 All this time, we followed the traditional yellow arrows that are linked to the ‘Caminho de Santiago’ and which had been very carefully painted on walls, light posts, rocks, paths, etc. 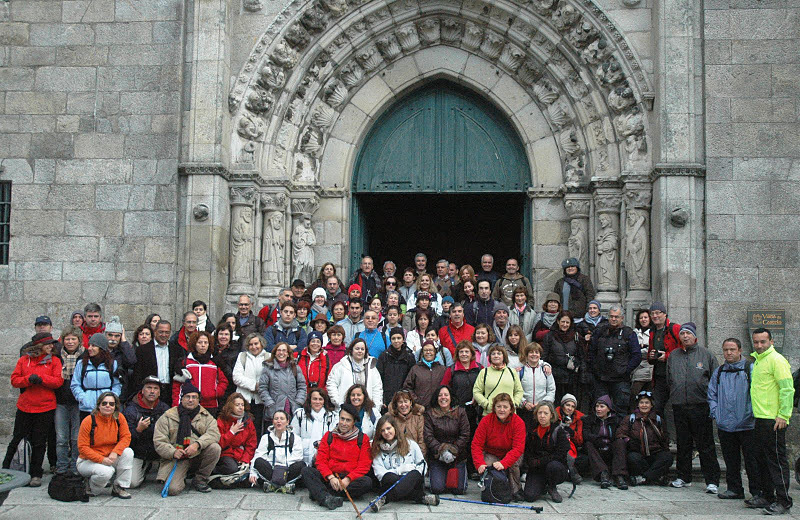 by the Viana group of Friends of the Caminho de Santiago. They have done an excellent job in providing guidance for other pilgrims and groups wishing to make the walk and our friends from Terra Verde (the organizers) arranged for one of their group to kindly accompany us on our walk to point out places of interest along the way. Another interesting and extraordinary home that we passed was Quinta das Cabanas (Convento das Cabanas – circa 1724) located in Cabanas, Afife. This was the home of the famous Portuguese poet and professor, Pedro Homem do Melo. It boasts a 280 year old magnificent magnolia tree beside it which is now a state monument with a plaque to commemorate this. Some of his works were written at Cabanas whilst he lived there and two beautiful old plaques with verses on them have been put up on each of the pillars of the original gates that lead into the farm area of the property. Lunch came as a very welcome break at Vila Praia de Ancora beginning with a hearty hot soup, delicious choice of grills, salad and chips and a typical Portuguese pudding for dessert. Colder days meant everyone was hungry and we were glad to sit and relax for a while. 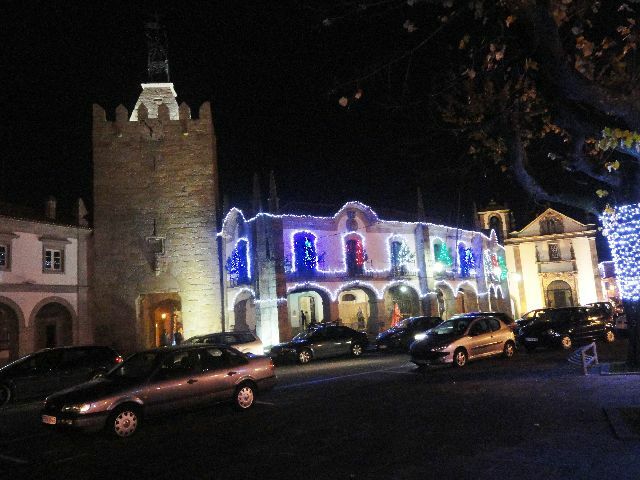 As we finally walked into Caminha at dusk (closing the walk at 27 kms), we were met with Christmas decorations and lights adorning all the main streets and historic buildings. Caminha is an ancient fortress town which overlooks the Minho River and its patrimony is both historically and architecturally rich. It has Medieval defensive walls, a Gothic Church, a main square surrounded by cafés serving traditional cakes. In addition it has a 15th century clock tower, a Renaissance fountain and as well a 15th century mansion called Solar dos Pitas which has seven fine Manueline windows on its upper storey. An extremely beautiful place to say the least and as we received our final ‘credential’ stamp and sat inside a warm and cosy café enjoying the local delights, we wished we could stay longer in this beautiful town. Part 5 comes next at the end of January 2012, Caminha (Portugal) to Oia (Spain) and the route covers the rugged Spanish coastline – can’t wait! Terra Verde have given us the entire program for 2012 with a walk a month, two in May and two in July for the close at Santiago! Thanks Terra Verde – great job so far. This entry was posted in Coats of Arms, History of Portugal, Walking in Portugal and tagged Minho Province, Pastry Shops, Photography, Portugal, Portuguese Food, Portuguese History, Portuguese Pastries and Desserts, Santiago de Compostela, Way of St. James, WWWP5K. Bookmark the permalink. I enjoyed reading your blog. Anxious for part 5! Here I am foolishly in the middle of your walk, which I would love to do. I was lured in by the mention of Viana and Caminha. What a fantastic trip! How long did it take overall? Hi, it took a year! Don’t laugh but I have a full time job and the walk is once a month on Saturdays with two of them being on both Saturday and Sunday. I loved it – all of it! I am starting a new walk this Saturday through the inland route. Need to finalise my post on reaching Santiago for the Coastal walk (been so busy) then the new walk will be put up! Many tks!